Durham, NC, January 18, 2019 --(PR.com)-- Many school systems are opting for Chromebooks in their classrooms. 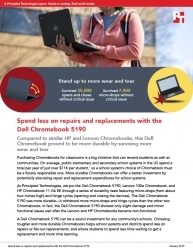 More durable Chromebooks can offer a better investment by potentially alleviating repair and replacement expenditures. PT put three Chromebooks—a Dell Chromebook 5190, an HP Chromebook 11 G6EE, and a Lenovo 100e Chromebook—through a series of durability tests featuring hinge cycles (opening and closing the devices) and micro-drops (from about four inches high). These are common things that students do to their Chromebooks throughout the school day.